Monsoons in coastal India, which run from June to September, are well know for their fierceness and relentless rain. As kids, we were all bundled up in raincoats and rain shoes, and sent to school looking like little rain slicked wet rats. Usually we were soaking wet by the time we arrived at school, and spent the rest of the morning trying to dry our skirts and overalls off. Usually the wettest of us lot were sat right under the school fan, so we would dry out faster. Of course this made us colder, and all we wanted to do was get out of there as soon as possible. If we were lucky, we would have a 'rain holiday', where we would trudge through gigantic puddles to get to school, only to be turned away at the gates... and then make our miserable way back, where we would drive anyone unfortunate enough to be home, absolutely crazy. Ah, happy days! In Karnataka, and as a result, in Mangalore, we used to have an almost month long break in October for the festival of Dusshera. My mum, on the other hand, taught in Kerala, where they had a fortnight off for the feast of Onam, usually end of August. And while we were usually latchkey kids, it was a real delight after a cold, wet, rainy miserable day, to come home from school, and have mum there, usually making us a hot snack or two to have with a cup of milky coffee or tea. Sometimes, if we were lucky we got these bondas with our tea. 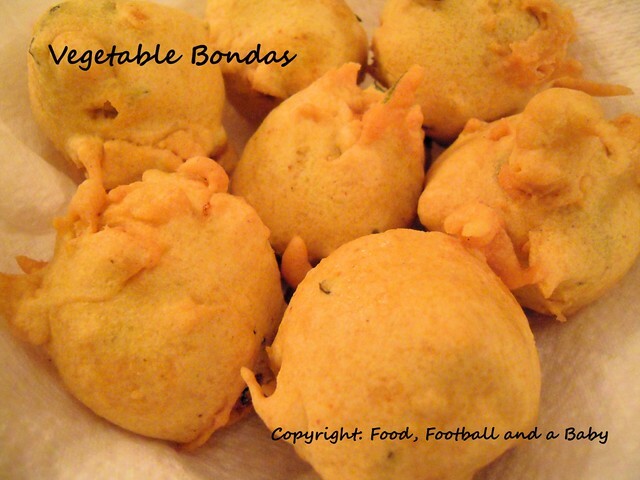 Bondas are a snack that are available through most of South India, and we see them piled up at the street vendors, and in little restaurants. 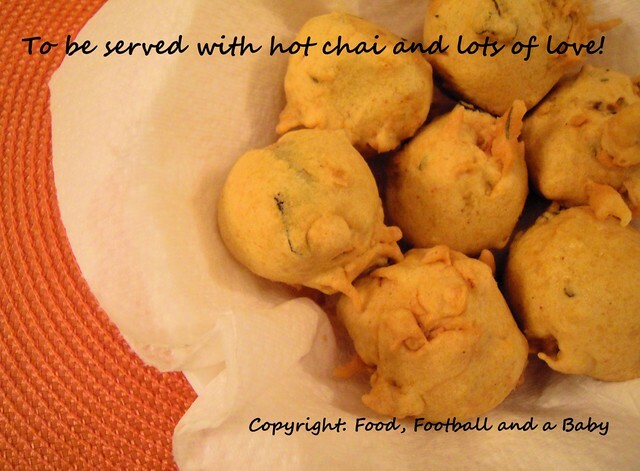 They are mainly served with chutney or ketchup, and basically comprise of a mixed vegetable and potato filling, coated with a spicy chickpea batter and deep fried. I cannot describe the way they tasted, crispy but soft on the inside, with a real spice kick from the chillies. Boil the potatoes, carrots, peas and beetroot (if using), until the vegetables are very soft. Drain and mash coarsely. In a small pan, heat the oil and add the mustard seeds. When the splutter, add the curry leaves, ginger, garlic, green chilly, chilli powder and garam masala. Sauté quickly for around 20 seconds, then pour into the mashed vegetables. Stir in the chopped coriander, and mix everything well. Add the salt, check seasoning, and add more salt if you think the mash needs it. Shape the filling into small balls, and pop into the fridge to firm up a bit, if possible. Meanwhile, make the batter. Stir together the chickpea/ gramflour, chilli powder, garam masala and salt. Add water little by little, until a thick batter is formed. The batter should be a little thicker than double cream. Adjust with more flour if the batter is too runny. 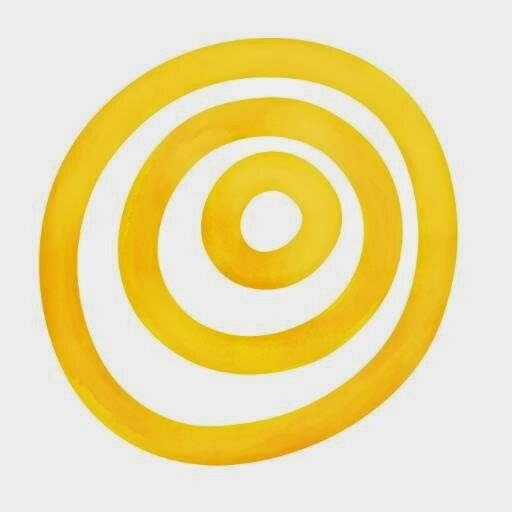 Keep aside for a few minutes. Heat oil for deep frying. The oil is at the right temperature when a drop of the chickpea batter rises quickly to the top covered in bubbles. Take out the shaped vegetable balls. Dip into the batter, so the balls are covered with the batter. Carefully drop the balls into the hot oil. 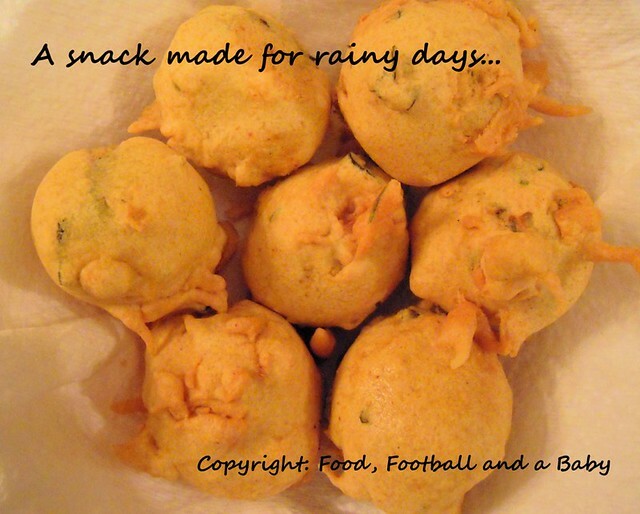 Again, like with other snacks, don't worry if the shapes are odd, it all adds to the taste :-) Fry the bondas till they are a light golden colour. Carefully lift out of the oil, and drain on kitchen paper. Serve hot with ketchup, coconut or mint chutney, and a cup of hot tea is de rigueur, of course! Note: If there is left over batter, just swirl it into the hot oil and fry till crisp. It tastes really good on its own too. Yumm!! Michelle u made my mouth water with just the sight of these lovely bondas :) I remember eating the best of bondas & sajjige after the 'mornache mees' :) You really made me feel nostalgic about the rains & the rain holiday! I am yet to try these, thnx for posting!